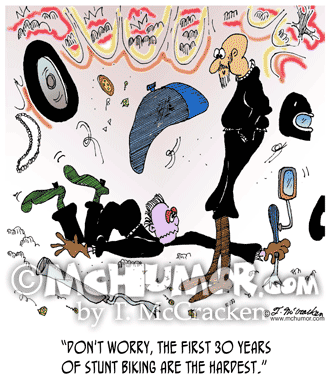 Bike Cartoon 7090: An old biker saying to a young one who's fallen, "Don't worry, the first 30 years of stunt biking are the hardest." 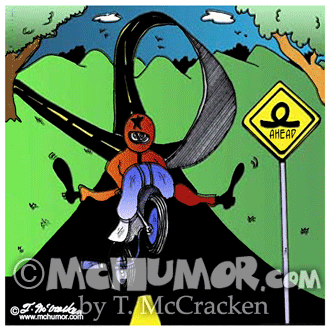 Bike Cartoon 7087: A biker seeing an Evel Knievel type of loop in the road with a sign for it. Bike Cartoon 7091: A nervous biker putting both legs into one pant leg. 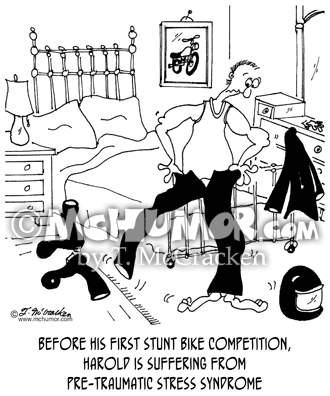 "Before his first stunt bike competition, Harold is suffering from Pre-Traumatic Stress Syndrome." 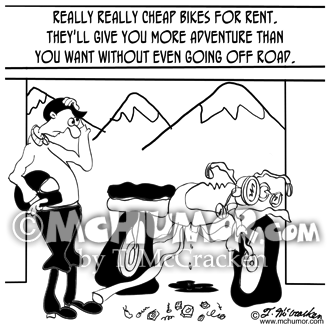 Motorcycle Cartoon 8978: A biker looks at a dilapidated motorcycle with a sign, "Cheap Bikes For Rent. They'll give you more adventure than you want without even going off road." 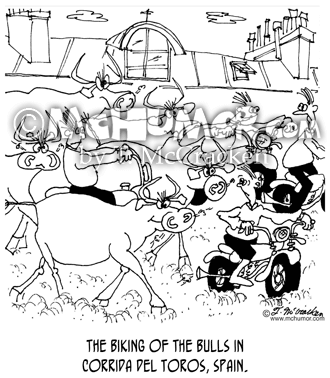 Bike Cartoon 6873: "The biking of the bulls in Corrida del Toros, Spain.” Bulls chase bikers. 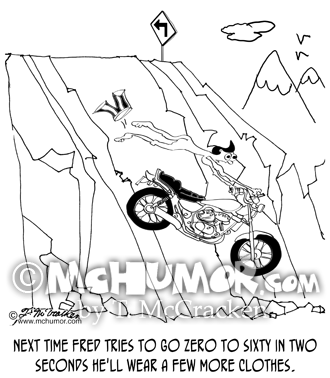 Motorcycle Cartoon 8909: A motorcyclist who's underwear flies off while driving off a cliff, “Next time Fred tries to go Zero to sixty in two seconds he'll wear a few more clothes." 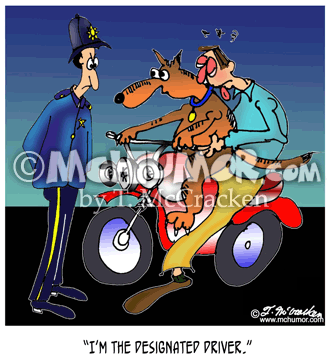 Dog Cartoon 7430: A dog driving a scooter while his drunken master hangs on the back says to a police officer, "I'm the designated driver." 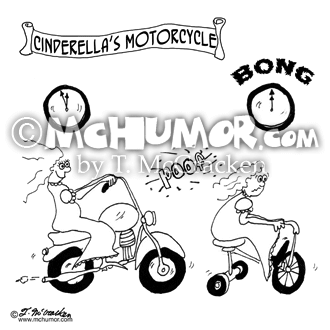 Truck Cartoon 8965: A motorcyclist is almost squished by two trucks. 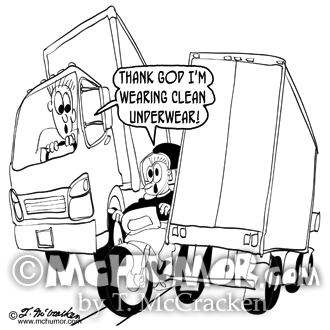 He and a trucker say, "Thank God I'm wearing clean underwear!" 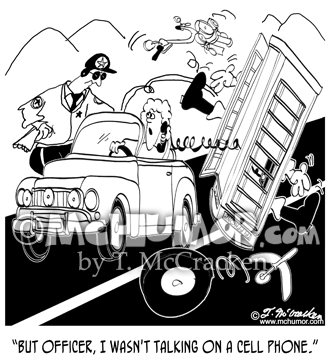 Phone Cartoon 8920: When a phone booth flies out of her car and hits a motorcyclist, the woman, who has the phone cradle to her ear, says to a patrolman, "But officer, I wasn't talking on a cell phone."